Carrillo's Pro A-beam rod design offers significant weight savings over stock connecting rods, while offering tremendous strength advantages. This translates into a more robust bottom-end for your high performance machine. Strength and reliability are the hallmarks of Carrillo connecting rods - and a critical foundation for your performance goals. Carrillo uses proprietary chrome, nickel, moly, vanadium alloy which meets all VAR (vacuum arc re-melt ASTM standards). The heat is validated, both by the supplier and an independent metallurgist whom confirm the desired physical and chemical properties of steel. All heat treat processes are via a mar-aged operation, resulting in UTS of 195,000 with a yield of 182,000 while maintaining the critical elements of low notch-sensitivity and ductility. 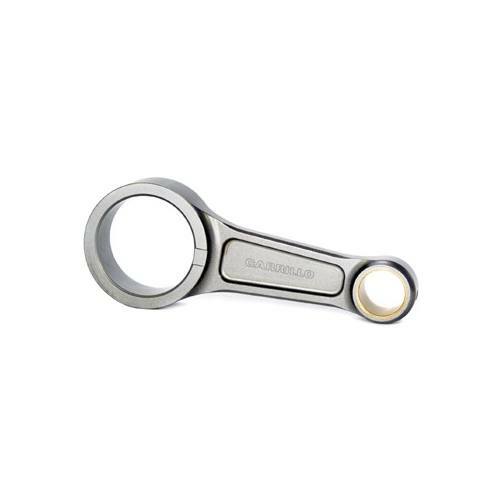 All Carrillo connecting rods are manufactured from an oversized forging resulting in the proper grain-flow as well as the surface removal of any potential inclusions or surface conversions generated by the forging process. All critical CNC machines at Carrillo are equipped with probing to accurately validate dimensional integrity. In the production process each part is magna-fluxed at least twice, further each piece is Rockwell tested to validate the heat treat procedure. A final shot-peen operation completes the part.